Pancake Day is just round the corner. 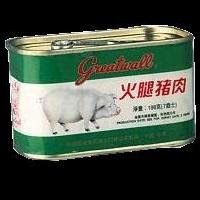 If you fancy something oriental and love Spam here is one spamalicious recipe to try. 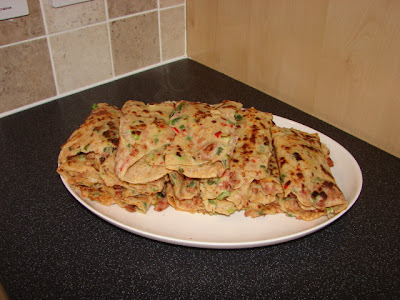 Not sure if this recipe was created by my mum or many Chinese do make breakfast pancakes like these, I love them since I was a kid and make them every now and again for Sunday breakfast when I have a hankering for Spam. We called these pancakes 'bok chang' at home, no sure if these two words in Cantonese or Hokkien. Spam or Chinese Luncheon meat 午餐肉 is very popular among Chinese we normally like to slice the loaf and fry with a bit oil till a bit crunchy on the outside and soft inside and serves with rice or instant noodles with a fried egg. This is an alternative way to use Spam in our family. Mix everything together, leave to rest for about 20 - 30 minutes for all the flavours to mix. Brush the pan with a lick of oil, I used a silicon brush. Make the first pancake, one ladle of mixture per pancake spread with a spatula. Wait till the mixture is dried and the underside is browned, flip over and brown the other side. Then flip/fold the pancake and cut into 2 or 3 pieces with the spatula. Continue making the rest of the pancakes without any oil or just a very light lick of oil with a brush. I used a 30cm non stick pan. I love to eat them with Sriracha Chili Sauce. 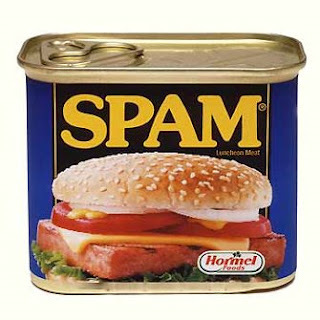 You know what is terrible (or good, depending on your particular taste) - I have never tried spam! Wow!!! I thought only my family uses the word "pok chang" for pancake. My grandma who is a Cantonese used to make pok chang in the afternoon as a snack. She makes it plain , just flour, margarine, sugar and eggs. I was very young then about 8 years old.Now that I am married, I have not made this sort of pancake for my children. Thanks for all the recipes. Saw a Cantonese drama not too long ago referring to pok chang. I am quite sure now it's Cantonese.